PANAM 5 valve manifolds pipe to pipe (R), pipe to flange (T) and flange to flange (H) designed for connecting system impulse lines & transmitters. 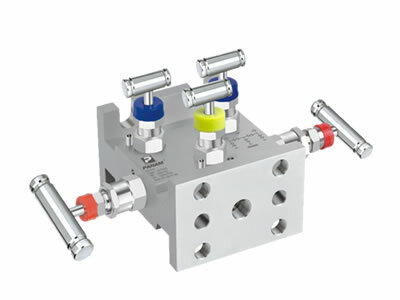 These manifolds consist of 1/2" NPT(F), pipe to flange or flange to flange connections on 54mm (2 1/8") centers, and of one equaliser valve, two block valves, one Bleed Valve and 2 nos 1/4" NPT(F) purge (VENT) connections. 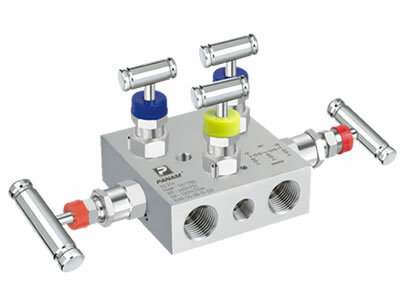 These manifolds are rugged in construction to withstand high pressures and temperatures. 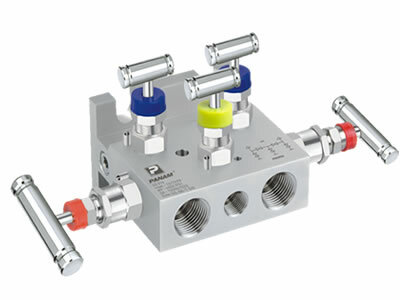 The manifolds are rated for pressures as high as 6000 psi at 200 o F or 4000 psi at 500 o F. with PTFE Packing. For a Higher Temperatures Grafoil Packing is used.